The Brook Trout having the scientific name, Salvelinus Fontinalis, is actually not a trout but one of the two species of char that are native to New York State. The other being the Lake Trout. The numbers of Brook Trout have declined greatly in their native range in New York, but populations still exist. There are many miles of small streams in New York that still support populations of Brook Trout, mostly in the Adirondack Mountains, the Tug Hill Plateau, and the Catskill Mountain regions. Due to stocking programs active since the 1800s, the actual genetic lineage of the Brook Trout in many of these waters is vague. The famous Beaverkill in the Catskills is a prime example of the decline of the brook trout. They were once abundant in the Beaverkill, but due to the river’s close proximity to New York City and increased industry, especially tanning mills, brook trout populations began to decline. Over fishing by tourists and declining water quality almost completely eliminated the brook trout from the Beaverkill by the end of the 1800s. In much of the native range the brook trout was replaced with non-native brown trout, imported from Germany, or the rainbow trout, which is native to the pacific northwest of north america. Today there are still populations of brook trout in the Catskills and brook trout are also stocked in the region by New York State hatcheries. The Beaverkill is now primarily a brown trout fishery. At present in New York, the Department of Environmental Conservation, manages many lakes and ponds specifically as Brook Trout waters, many of these are known to support natural reproduction. Each year fish of four pounds are landed. Although, the populations of naturally reproducing Brook Trout is low compared to those that existed in history, a handful of “heritage” strains are said to exist in New York and these strains are being protected. Brook Trout prefer cold water and will not survive in water with a sustained temperature above 65 degrees Fahrenheit. They typically spawn in streams October through November, but may also successfully spawn on the bottom of a lake or pond. They will spawn at the young age of 2 years old. They are a beautiful species of fish, characterized by wavy yellow markings, called vermiculations, on the back and dorsal fin. Along the sides are red dots surrounded by blue halos scattered amongst yellow spots. The underside can range from crimson, on a spawning male, to yellow or pink and the fins display a range of colors with black and white borders. 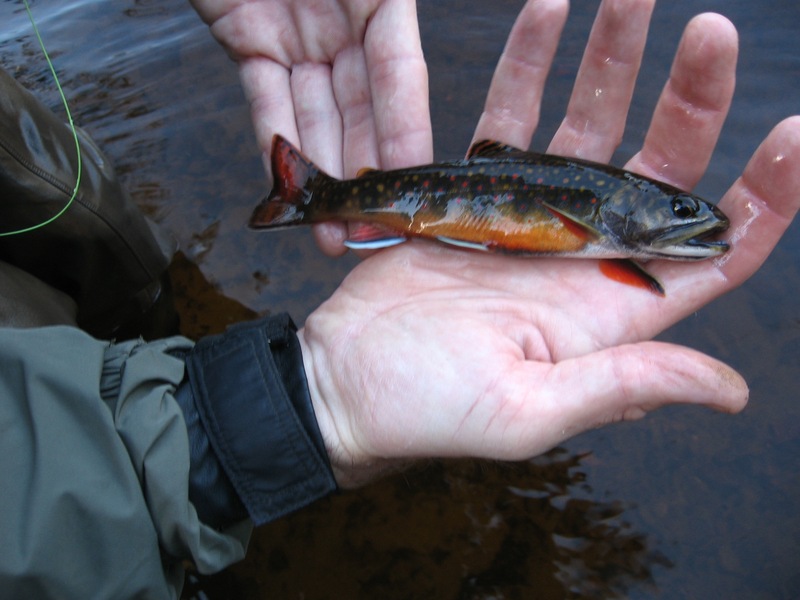 In small streams brook trout will not grow to very large sizes rarely reaching 12 inches long. They mostly feed on aquatic insect nymphs and larvae. Fly-fishing for Brook Trout in small streams is a truly fun endeavor. A 6-7 foot 3wt rod is perfect for casting small wet flies and dries. Brook Trout are opportunistic feeders and will feed when food becomes present and will often take a swinging fly. The streams in New York that harbor Brook Trout don’t usually have sustained insect hatches, so Brook Trout are typically eager to attack a fly. Small hare’s ears or an adams are a good start when choosing a fly. One of my favorite flies that I used to fish for Brookies as a kid was a red ant pattern. Have fun with these little guys, if you find them you will most likely have the stream to yourself. Remember the general trout season closes on October 15th. Check regulations guide for streams with extended fishing seasons.